Today’s world is full of technological benefits. 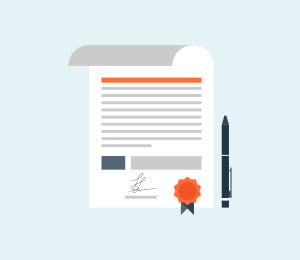 Transferring data from one part of the world to another can be done in the blink of an eye. Transferring data from one phone to another should be that simple right? Well, it is if you are using devices with the same OS. But, what should you do if you want to transfer data from, let’s say, Android to BlackBerry? Don’t worry. 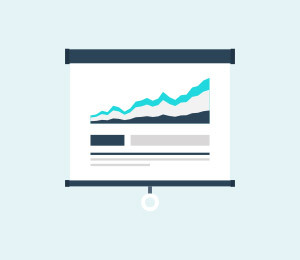 It is possible, and we will guide you step by step through the entire process. 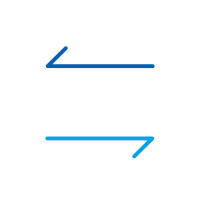 When transferring data from Android to BlackBerry, you can’t use Bluetooth or a third party software that will help you speed up the process. And unfortunately, you will sometimes wish that you can speed up this process. You can try to manually transfer data from Android to a computer, and then from a computer to BlackBerry, but this process can take hours. It is boring to transfer the files from one place to another, and the time it takes is a real pain in the neck. And also, it is impossible to transfer apps from Android to BlackBerry because of different operating systems. Sometimes, not even all photos, videos and music files will be compatible. 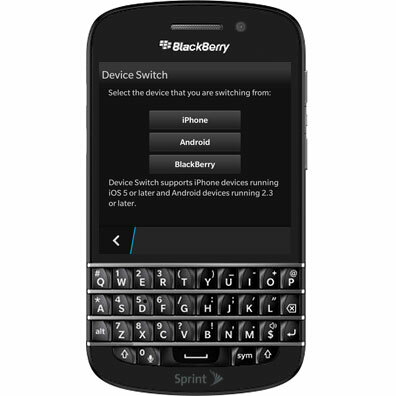 But, luckily, the BlackBerry developers have thought of a one way, which is simpler than the manual transfer mentioned above, to transfer your data from Android to BlackBerry. It takes less time, but you still need to do some work. 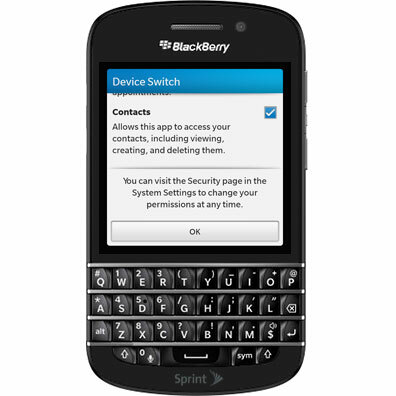 The BlackBerry developers have thought of an app that will help you transfer your contacts, calendar videos and photos from and Android device to a BlackBerry. You will not need to connect the devices to a PC or Mac. You will only need to connect both devices to the same Wi-Fi network. The app is called Device Switch. 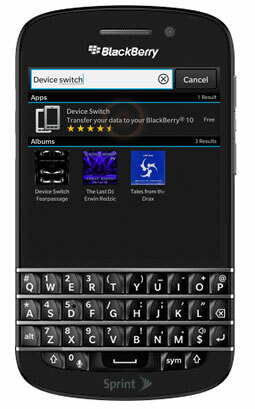 From the Home screen of your BlackBerry tap the ‘BlackBerry World’. Then, tap the search box and enter ‘Device Switch’. After the device shows up, tap it. Then, you should be able to see the ‘Download’ button on the right side. Tap it, and wait for the app to download. 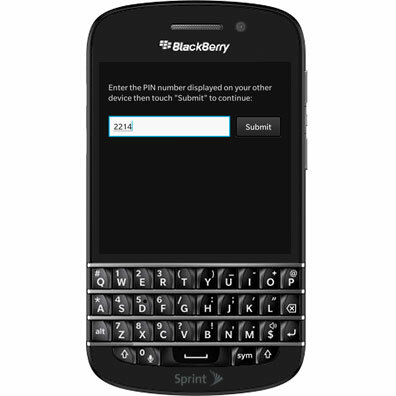 You may be prompted to enter the login information for your BlackBerry ID account. Once the download is done, ‘Open’ button will appear. Tap it. 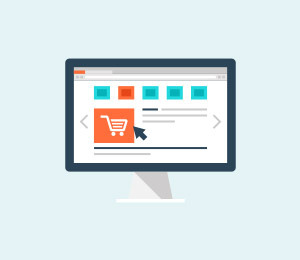 You should read through the top half of the screen, and make sure that the preferred options are checked. Once you finish reading, click ‘OK’. After pressing OK, swipe left. A new screen will show up. You will have the option to choose the device you are switching data from. Make sure to click Android. 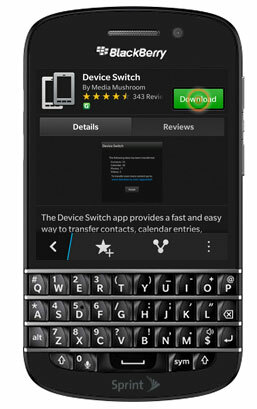 Then, download the Device Switch application from Google Play on your Android device. 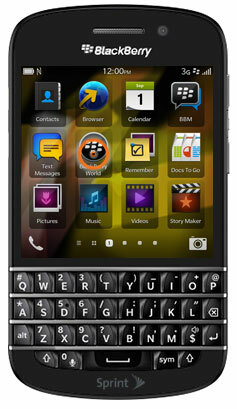 When the application is installed, open it, tap next and then RIM BlackBerry Device. Note the PIN code and enter it on your BlackBerry when prompted. 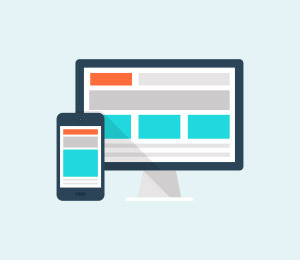 Make sure that the preferred sync options are checked on the Android device and then tap ‘Next.’ These two devices will establish a connection using the same Wi-Fi network. Once that happens, the transfer process will begin. The process may take a while. It depends on the amount of data which is being moved. Once the transfer is done, tap finish. And that is it! The content from the Android device was successfully transferred to your BlackBerry device. The Device Switch app is very reliable. But, there is one downside. 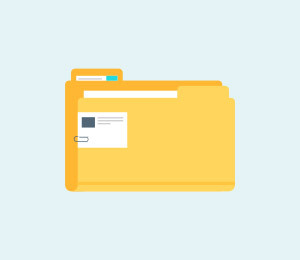 You cannot transfer all file types using it, and the process may take a lot of time sometimes. But, we have found an even easier way. It is software called dr.fone - Switch. Keep reading to find out more about it! dr.fone - Switch can transfer all kinds of data including text messages, call logs, contacts, and of course, photos, videos and music. 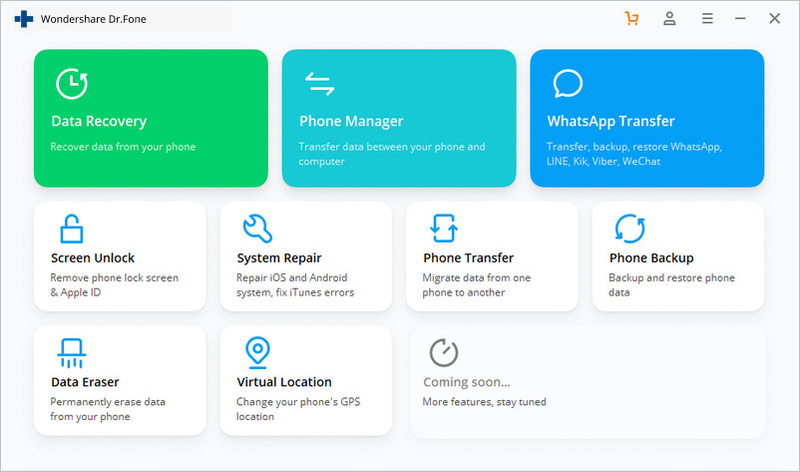 The software does not only enable transfer between Android, iOS and Symbian, but also restores data from iTunes, iCloud, kies and BlackBerry backup files. It supports more than 3000 phones currently, from all manufacturers. Transfer all contacts, music, video and music, from Android to BlackBerry. Step 1: In order to transfer data from Android phone to BlackBerry, you are supposed to download and install dr.fone fisrt. And then launch Mobiletrans and select the "Switch" mode. 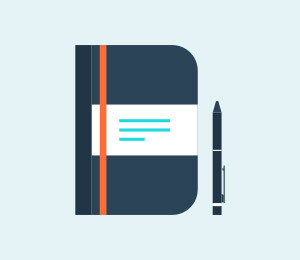 Step 2: Connect both your Android device and BlackBerry phone to your computer. 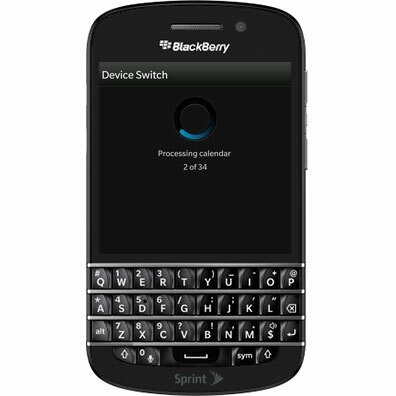 On the window below, you can click the "Flip" button on the program in order to switch the destination and source phones, please make sure that the BlackBerry phone is the destination. Then you can select the contents you'd like to transfer. 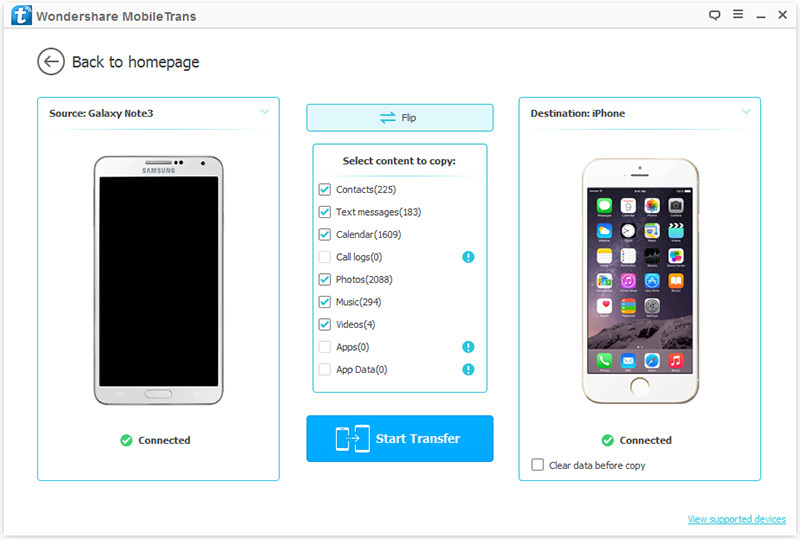 Step 3: After you select the transfer contents, just click "Start Transfer". 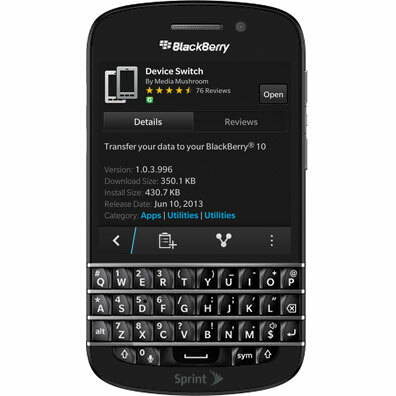 Then the program MobileTrans will start to transfer data from Android to BlackBerry. After a few minutes, the process will finish. 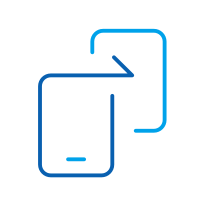 Do you know the ways to transfer contacts from one samsung device to another? If you don't, here are the 3 ways for you! Looking for ways to transfer music from Android to iPod? 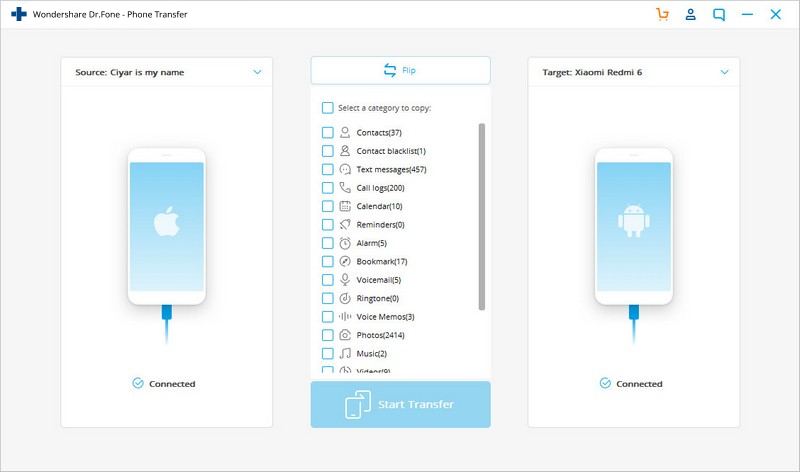 Why not try this Android to iPod transfer tool? It helps to transfer music from Android to iPod.